PHOTOMO » shoes in the sky…? Its perfect. I can write a story on that shoes. Yes, there IS a story..
i really like this. the composition rox. 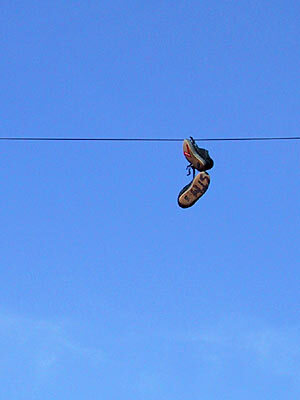 thats cool, I always notce when shoes are hanging like that on a telephone line. Great shot of a very original subject. I like the simplicity in this one. Please, let me know where you did that, cause i’m looking for it in several cities of Europe?